Don't be fooled by cheaper off-the-shelf caster cups made for household furniture! The new and improved design of these caster cups offers an economical, yet durable option for protecting your floors from piano caster damage. 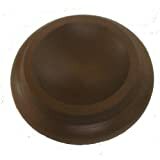 These piano caster cups are designed to withstand and support the weight of your piano while protecting your floors. Will work on wood floors, tile floors, and even carpet. Bottoms are lined with felt for an additional layer of floor protection. These cups measure 3-5/8 inches outside and 2-5/16 inside diameter. In other words, the size of the casters on your piano should be 2-5/16" or less in diameter.